If the installation is in a clean, non-hazardous environment with an acceptable ambient (outside the enclosure) temperature range, a simple forced-air cooling system utilizing outside air is usually adequate. Combined with an air filter, such devices generally meet the heat removal needs of typical electronic equipment and many electrical applications. 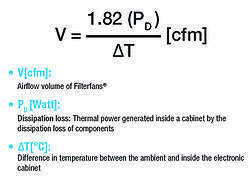 How do I know if a Filterfan® is the right product for my application? If multiple configurations are needed. 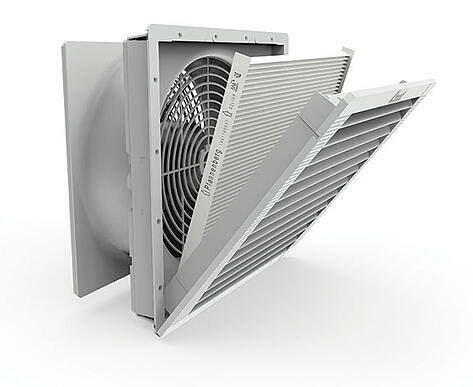 Filterfans® can be located in a number of locations within complex enclosure configurations. To properly size a Filterfan® it’s important to understand how static pressure effects the performance of a fan. 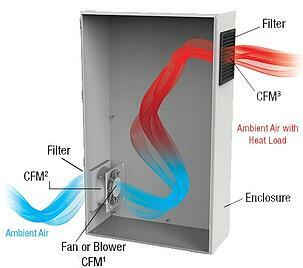 Always use the Filterfans® to propel the cool ambient air into enclosure. Slight positive pressure builds up inside the cabinet so that only air filtered by the Filterfans® flows into the enclosure. 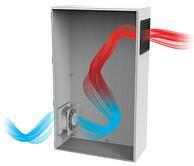 The air propelled into the cabinet displaces the warm air which exits through the exhaust filter. When installing a combination of Filterfans® and exhaust filters, fit the Filterfans® in the lower third of the cabinet and the exhaust filter(s) near the top of the cabinet. Part 1 of our Thermal Management Solutions, Pfannenberg's Filterfans® incorporate modern louvers which enable maximal airflow, hold back dust/flour and water particles, protect the filter medium from damage and can be integrated into the design of the application. Filterfans are an ideal cooling solution when the ambient air is always lower than the temperature required in the electrical enclosure. This assists the natural convection of the air and avoids hot spots withing the enclosure.